View the size chart. Shoe running little small. Suggest choose bigger size. High quality suede leather upper with fine sense of touch; Uneebtex membrane with waterproof and breathable functions; One-piece tongue prevents wind, sand, water and gravels from penetrating; The combination of EVA midsole and rubber outsole offers impact cushioning, anti-twist, abrasion-resistant and skid-proof performance. The brand name Clorts is the combination of "Climbing" and "Sports", which concentrates on the innovation and exploration of Outdoor shoes. 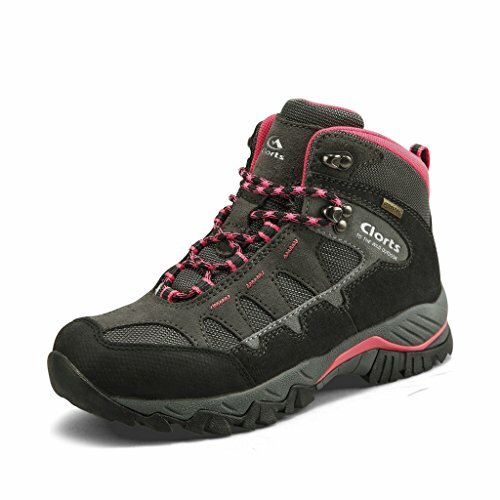 Clorts was established formally in 2006 as an all-weather outdoor shoe company and is striving to create the suitable shoes for the outdoor enthusiasts. Right now Clorts integrates top international designers from Italy and Korea and R&D team to form a set of shoe design, research and development, quality control, production and sales in one of international middle-end outdoor shoe brand. Making perfect shoes is our commitment! Every model passed the strict machinery tests and real-condition tests before being launched onto the market. Our designs mix the fashion and professional outdoor technology to ensure you enjoy the best outdoor experience in a safe and comfortable way with CLORTS shoes. No matter where you are going from simple light hiking to professional expedition, we surely have one pair of shoes that fits you. WATERPROOF and BREATHABLE : Hiking boots featuring Uneebtex waterproof membrane and protective toe cap. Rubber toe cap offer greater protection and durability, and make walking more comfy. Keep your feet dry. Whether on wet stones, or gravelly and sand covered rocks. COMFORTABLE and LIGHT-WEIGHT : Mid-height hiking boots is made of breathable mesh and high quality suede leather with high strength and excellent durability. No breaking in. Easy to walk in. Good arch support. SUPPORTIVE and STURDY : Rubber outsole with multi-directional traction, featuring skid-proof and abrasion-resistant; EVA midsoles supply excellent cushioning; Anatomically-shaped footbeds provide extra comfort, ventilation, better dampness absportion and less unpleasant odor. OCCASION: Extensive occasion suited, ideal for hiking, backpacking, trekking, camping outdoor sports, urban leisure, walking, travelling. NOTE : The hiking shoes run a bit small. Recommend ordering a half-size up or full size up from your normal size if your feet wide or wear hiking socks. If the shoes do not fit you perfectly, all you need to do is to pack them in the original box and follow Amazon return procedure. If the shoes do not meet your expectation or you have any concerns, please do not hestitate to contact us because we are always here to help until problem completely solved! If you have any questions about this product by Clorts, contact us by completing and submitting the form below. If you are looking for a specif part number, please include it with your message.